California’s vital agricultural industry and our rural economies depend on conserving our remaining farmland. Each year, California loses an average of 50,000 acres of agricultural land, the equivalent of more than one and a half times the area of San Francisco. This loss of farmland, especially to urban and suburban development, also contributes to rising greenhouse gas (GHG) emissions. A 2012 study by UC Davis researchers found that an acre of urban land emits 70 times more GHGs than an acre of irrigated cropland. As part of the state’s efforts to support urban in-fill development and reduce vehicle miles traveled, in 2015 the state launched the Sustainable Agricultural Lands Conservation Program (SALCP). SALCP is a competitive grants program administered by the Department of Conservation and it funds both permanent conservation easements and strategic planning and policy development grants for local governments to protect farm and ranch land at risk of development. CalCAN and our partners advocated for the creation and improved funding for SALCP. Following our efforts, SALCP now receives 10 percent of the SGC’s cap-and-trade allocation, which has greatly improved funding for conservation easements on at risk agricultural lands. Read about the SALC Program and other farmland conservation policies for which CalCAN has advocated in the past. 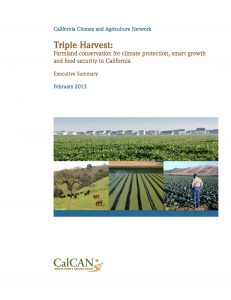 Triple Harvest: Farmland Conservation for Climate Protection, Smart Growth and Food Security describes the many essential services provided by California farmland and the development threats to them, and outlines policy recommendations for protecting agricultural lands.